Water is a constant on any gardener’s mind. If you’re ready to take your first stab at organic gardening, be thinking about how you’ll water your plants before that garden is even a twinkle in your eye. Vegetable gardens need about 1 inch of water each week. That’s about a tuna fish can full, for every little bit of soil surface. Which, depending on the size of your garden, can be a lot! Gardeners take many approaches to getting their plants watered, which we’ll cover shortly. When siting your garden, get as close to a water source as possible. Measure rainfall with a can, or a proper rain gauge, available at local garden centers. Water deeply at least once weekly, provided you haven’t received adequate rainfall. Water early in the morning if possible, to avoid damp leaves at nightfall. This will help with slug issues, disease pressure, and will avoid loss of your water via transpiration in the hottest part of the day. Water at the base of your plants, with a soaker hose, watering wand, or drip irrigation. Avoid watering overhead, which will soak the leaves of the plants instead of the roots, risking transpiration of the water you’ve added, and lending to a generally inefficient watering. Remember that a drought-stressed plant is more susceptible to weed, disease, and insect pest pressure. Take a look at keyline design when planning your garden. Keyline design takes into account topography when assessing the watering needs of gardens and farms to make best use of water resources, and increase soil fertility. Hoses: There’s always the trusty garden spigot and a rubber garden hose. Pulling the hose around, and getting a nice spray of water will be your biggest concerns, here. Consider buying a hose reel so you can store your hose safely out of the way of the lawn mower, and move it from bed to bed easily. If you choose to water by hose, you will absolutely want a watering wand (like a showerhead for plants) that will give you a nice, even spray. Find reels and watering wands at your local garden center. Soaker hoses are hoses that are permeate water slowly as long as they are filled by a consistent water source. If you’ve ever seen a bed of roses or other perennial plants with black, rough-ish tubing woven around their base, that’s soaker hose. Gardeners attach it to a normal rubber hose when they want to water, and turn the spigot on. As the water fills the soaker hose, it slowly trickles out to the plant. 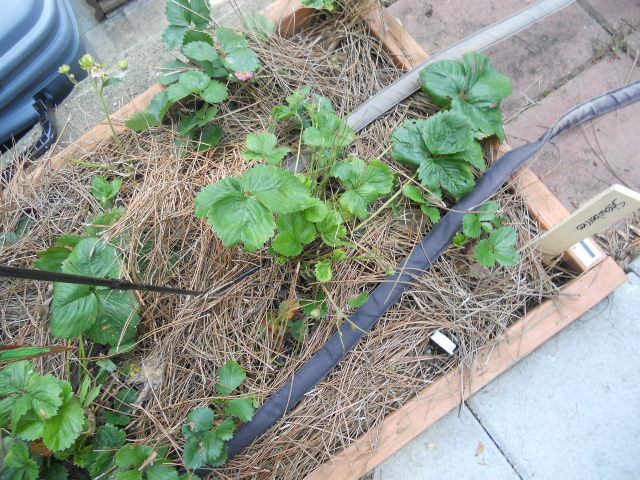 One drawback to this watering method is dealing with weeds as they grow up around the coiled soaker hoses. You’ll be nervous to weed eat, as you won’t want to nick the hose itself, and tediously hand pulling from in between the hose coils can really be a pain in the neck. Best to use them in combination with a good mulch! Watering cans and buckets: When all else fails, haul it! You can always fill buckets or cans and carry water to your thirsty plants. Sprinklers are not ideal, as they water the leaves before the roots, and tend towards inefficiency, as water is easily lost due to transpiration. Drip irrigation is by far the most efficient way to water, and it’s the preferred method of watering on commercial farms. Drip irrigation is simply a system of pipes and specialized plastic tape that emits water drop by drop along a row of plants, right at the base. 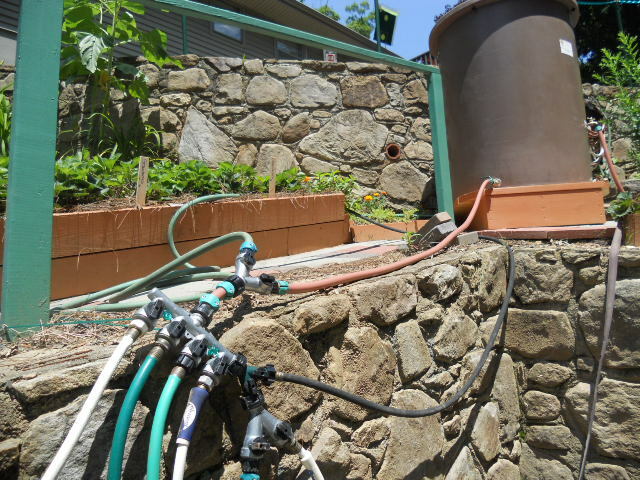 Gardeners can set up a drip irrigation system fairly easily on the home scale. Rain barrels may not be a watering technique on their own, but they are a great addition to any watering system you may choose and definitely something to consider when installing your irrigation. Typically, rain barrels are set up at the edge of a roofline where water from your gutters can be directed into the barrel for storage and later use. Keep in mind that water always gives way to gravity when deciding where to put your rain barrel. Most likely, you’ll use a combination of techniques to get water to your garden. As you prep your garden each season, just be thinking about improvements to your system that will make watering less work for you, and most available to your veggies.